For the law which governs relationships between individuals and the government, see Public law. An Act of Congress is a statute enacted by the United States Congress. It can either be a Public Law, relating to the general public, or a Private Law, relating to specific institutions or individuals. The term can be used in other countries with a legislature named "Congress", such as the Congress of the Philippines. In the United States, Acts of Congress are designated as either public laws, relating to the general public, or private laws, relating to specific institutions or individuals. Since 1957, all Acts of Congress have been designated as "Public Law X-Y" or "Private Law X-Y", where X is the number of the Congress and Y refers to the sequential order of the bill (when it was enacted). For example, P. L. 111-5 (American Recovery and Reinvestment Act of 2009) was the fifth enacted public law of the 111th United States Congress. Public laws are also often abbreviated as Pub. L. No. X-Y. When the legislation of those two kinds is proposed, it is called public bill and private bill respectively. The word "act", as used in the term "Act of Congress", is a common, not a proper noun. The capitalization of the word "act" is deprecated by some dictionaries and usage authorities. Some writers, in particular the U.S. Code, capitalize "Act". This is likely a result of the more liberal use of capital letters in legal contexts, which has its roots in the 18th century capitalization of all nouns as is seen in the United States Constitution. "Act of Congress" is sometimes used in informal speech to indicate something for which getting permission is burdensome. For example, "It takes an Act of Congress to get a building permit in this town." The President promulgates Acts of Congress made by the first two methods. If an Act is made by the third method, the presiding officer of the house that last reconsidered the act promulgates it. Under the United States Constitution, if the President does not return a bill or resolution to Congress with objections before the time limit expires, then the bill automatically becomes an Act; however, if the Congress is adjourned at the end of this period, then the bill dies and cannot be reconsidered (see pocket veto). In addition, if the President rejects a bill or resolution while the Congress is in session, a two-thirds vote of both houses of the Congress is needed for reconsideration to be successful. Promulgation in the sense of publishing and proclaiming the law is accomplished by the President, or the relevant presiding officer in the case of an overridden veto, delivering the act to the Archivist of the United States. 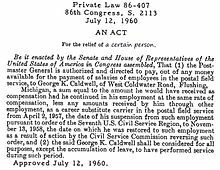 After the Archivist receives the Act, he or she provides for its publication as a slip law and in the United States Statutes at Large. Thereafter, the changes are published in the United States Code. An Act of Congress that violates the Constitution may be declared unconstitutional by the courts. The judicial declaration of an Act's unconstitutionality does not remove the law from the statute books; rather, it prevents the law from being enforced. However, future publications of the Act are generally annotated with warnings indicating that the statute is no longer valid law. List of United States federal legislation for a list of prominent acts of Congress. ^ See 1 U.S.C. § 106a, "Promulgation of laws". ^ 1 U.S.C. § 106a, "Promulgation of laws". ^ 1 U.S.C. § 113, "'Little and Brown's' edition of laws and treaties; slip laws; Treaties and Other International Acts Series; admissibility in evidence". ^ 1 U.S.C. § 112, "Statutes at Large; contents; admissibility in evidence". 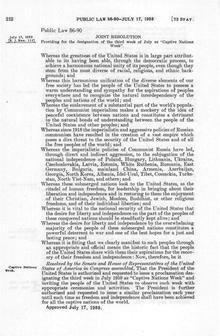 Look up act of Congress in Wiktionary, the free dictionary.